New Toy : Samsung Galaxy Note 7 | Life, The Universe and ... Everything! "my Note 3 is good enough"
"If my Note 3 ever dies I'll just go find another Note 3"
"I hardly use the S-Pen, for my next phone a Xiaomi will do"
So how did I end up with this then? Well my Note 3 has been acting up recently. In the last year or so, the camera has occasionally been unable to focus, with wavy lines in the picture. The problem comes and goes, but I it has ruined a number of otherwise perfect pictures. I could probably replace the camera module for RM150 or so, but despite the irritation of I never got around to it. More recently, the almost three year old battery has been giving me a lot of grief. My spare batteries, while lasting longer than the original, were also not giving me a full day's charge. If I were to buy a new battery now, it's likely that it's been sitting on a shelf for two years or more, and would have degraded some what. And finally ... what is it with phones and tablets that they just get slower and slower as they age? There was a time when my Note 3 was super fast, Now it takes seconds to do anything. So my Note 3 is showing it's age. That's normal ... three years makes it one of my longest lasting phones. But why get another Note? Plenty of reasons not to actually ... the main thing being the price. With the depreciating ringgit and GST on phones, these things are now a third more expensive than they used to be. And given I hardly make use of it's features, it's hard to justify the outlay. There are plenty of alternatives out there right? A number of my friends who used to use Samsung phones and have moved on the phones priced closer to the thousand ringgit mark, with specs that closely match Samsung's latest and greatest. How are they doing? "Sorry ... My GPS doesn't work!" "Phone just suddenly stopped recognizing the SIM card!" "Phone Battery went flat and now it won't switch on even with charger!" "My wife says never buy her a cheap phone again! Apple or Samsung only!" "Wife complaining about phone again!" So there I remained in limbo ... grumbling about my Note 3 while not particular desiring any of the alternatives that came up. Instantly "New Toy" logic starts taking over my mind. 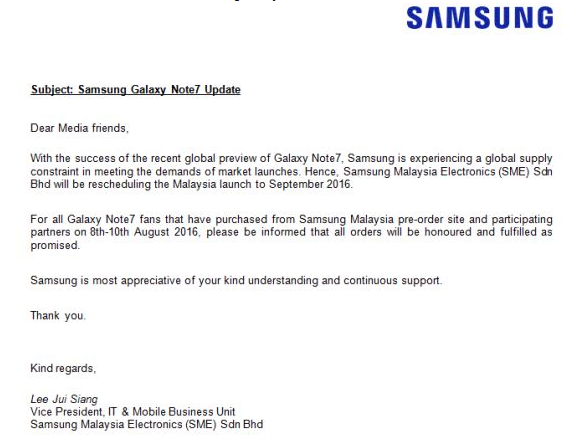 See, eventually my Note 3 will die and I will probably end up replacing it with another Samsung, so why suffer the next few months and get a Note 7 then, when I could get a Note 7 today and be happy? 😎 And the discount and bundle are a once-only offer. Must buy now, ya? Since the pre-order is limited to 4,000 units only, I decided to leave it to fate ... if I qualify I'll get the Note 7, otherwise I'll just stick to the Note 3 for a few more months. Oh heck, what have I done? The mind starts filling with all the things I could have bought for that kind of money. Ooh ... looks like I will be one of the few with a Note 7 in the country for a while ! 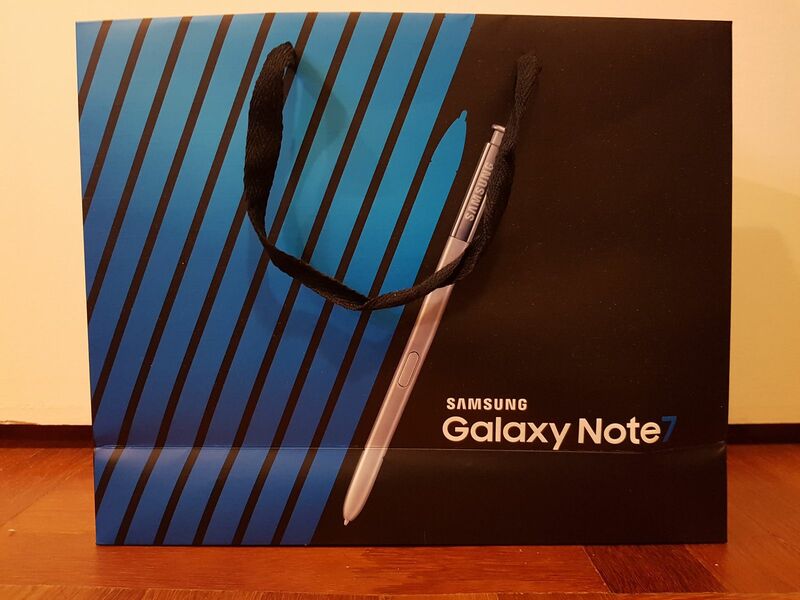 18 August 2016 -- The day finally arrives and I head to The Curve where there is a Samsung outlet which I had selected to collect my Note 7 from. 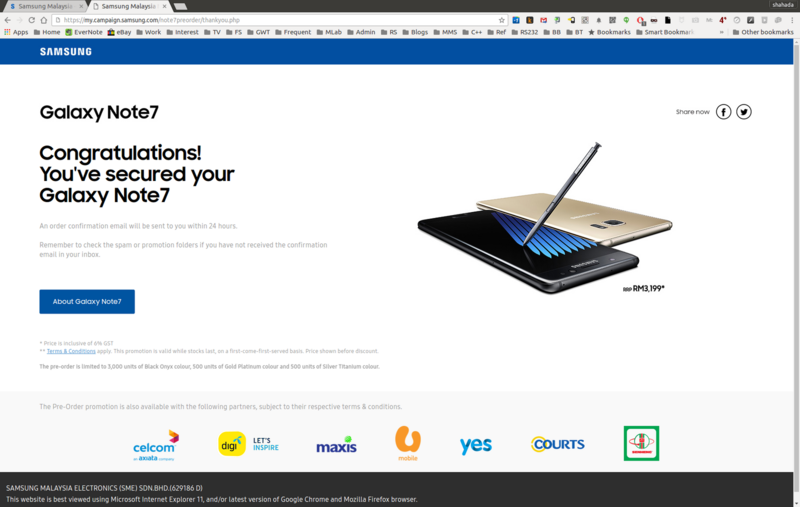 It was convenient for me because there's also a Maxis center at the eCurve next to it, where I could also get my SIM card converted to a nano sim that the Note 7 needs (yeah I now have a mess where I need a Nano for the phone, a Micro for my tablet, and a Mini for testing cell modems). Unlike the other Samsung outlets on that day there wasn't a crowd at The Curve, so I was attended to within minutes. I showed my deposit receipt and confirmation email, and paid the balance ... and got my new phone, together with a bunch of free gifts. I played safe and chose the Black Onyx model. It's a bit understated, and i really wish Samsung would colour the top and bottom panels a deeper black to match the unlit OLED screen (so it would look a bit like the Galaxy Nexus ... in my eyes one of the most beautiful phones ever). If I had a chance to see the actual models in-real-life before ordering I think I might have gone for the Silver or maybe even Blue. This is my first all-glass phone (although iPhones have been this way for some time). Yes, it does feel more solid, but to be honest I was quite happy with the plastic-backed faux leather on the Note 3. I usually carry my phone naked (the phone, not me) with no case or bumper. I'm not so sure about the Note 7 though ... it's less grippy due to the glass an I am more concerned over dropping it. I recall a product called eGrips from years ago which were some stick on pieces you could apply to your phone to make them easier less slippery. The "gorilla glass 5" is supposed to be less prone to shattering. On the contrary, the 'horror" videos on YouTube (here, here and here) indicate that glass cracks easily, especially on the curved edges, which are its weakest point. Wrapping up the phone in a case or bumper will probably help, but then what's the point of having it all glass if the case is going make it feel plasticky again? I'm beginning to think getting insurance may be best solution to this. The Edge is Samsung's answer to "what's the advantage of being able to curve an OLED display?". The initial idea (as seen on the Note Edge) has a large 160 pixel wide curve right edge, which can be seen clearly out the side, even when the phone is used with a case that covers the front. The edge therefore acts as secondary display on the phone. The only reason to feature an Edge on the Note 7 that I can think off is to shave off a few millimeters from the width of the phone. If you're going to do that but mess up the display at the sides, why not just make a smaller display? Not so smart, Samsung. On the Note 7, the edge is used to show a date / time summary when the screen is "off" (with AMOLED you only power the pixels you need "on"). Because of the limited space, the result is just weird to me. Also, there is a "drawer handle" that is always present regardless of what app you have on screen, and this panel can be used to launch other actions or apps. The Samsung App Store sells add-on panels; I bought one for MYR4 that lets me put my frequent Google Hangout contacts there so I can get to them easily. It's handy, but nothing that really necessitates the need for the Edge. 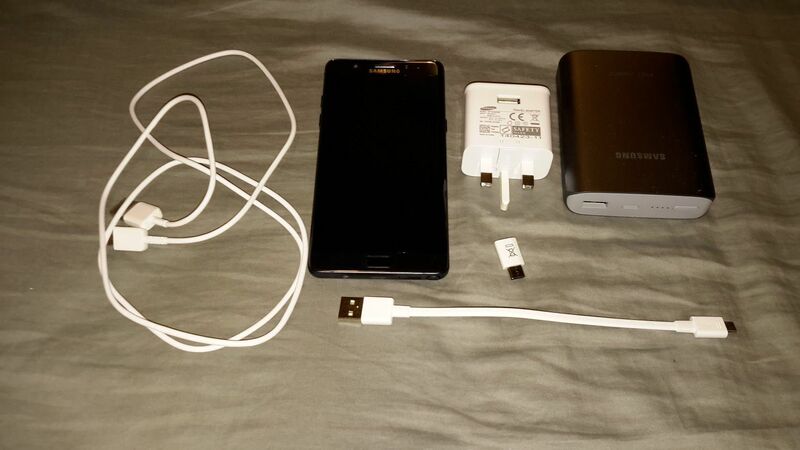 The charger that comes with the Note 7 supports "Adaptive Fast Charging", by being able to supply 9V 1.67A and 12V 2.1A power to the phone, in addition to the standard 5V 2.0A USB standard power. It uses it's own protocol for this, not the official USB C official "Power Delivery Specification" protocol, which is a slight bummer. It's also a violation of the standard to use that on USB type C connectors. That's not an issue on the Note 7, but probably something you need to be aware of if sharing power adapters with other "proper" USB Type C devices, such as a Nexus phone. Despite this, the Type-C connector on the phone is something nice to have, as we've all experience the triple flip necessary with microUSB plugs. The Note 7 comes with a microUSB to type-C adapter, so you can charge the phone using the handful of chargers you already have already placed at every conceivable place you will be. However, this too is fraught with risk, as if you get additional adapters you need to be sure they follow the spec correctly, and have a 56Kohm resistor on one of the control lines. Not having that is probably not an issue for the Note 7, but if you use an old usb charger with a improper adapter on a real USB C device (Nexus phone or laptop), it is likely to damage something in an expensive way. This leads me to conclude that the safest policy to adopt with the Note 7 is just use your own power adapters and keep them to yourself; don't share. 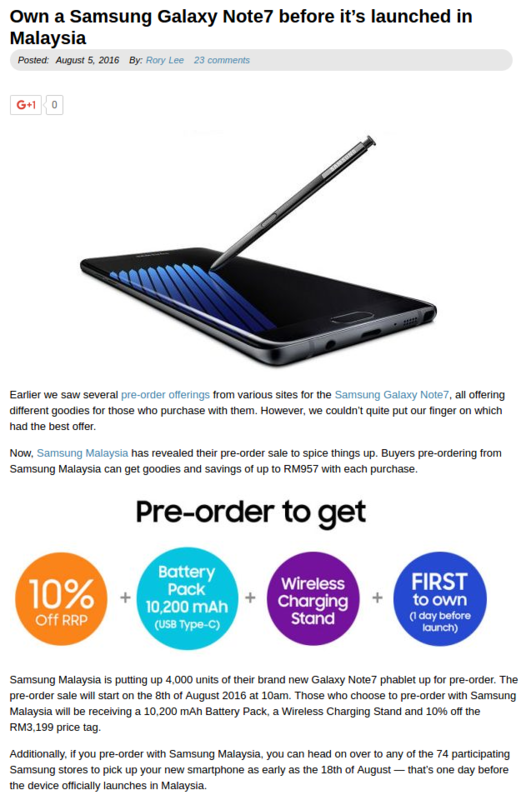 Oh, those who pre-ordered the Note 7 also get a Samsung 10,000mAh power bank. For me this makes up for not having a removable battery on the Note 7. It's a bit of a mess though, as as the input port on the power bank is a Type C, but the output port is a USB type A (PC style). The idea is that you would use your Note 7 power supply to charge it, either with a USB-A to Type C cable (supplied with the Note 7), or a USB-A to MicroUSB cable + MicroUSB to USB Type C adapter (supplied with the extra Travel Charger for those who pre-ordered). Then you charge your device with the other cable you have (USB-A to MicroUSB cable + MicroUSB to USB Type C adapter or Usb-A to Type C cable). To further complicate matters, the power bank also comes with a very short USB to microUSB cable which us handy to reduce the tangle of cables. But this also needs the MicroUSB to Type C adapter. This is nothing new with the Note 7, but since the pre-order came with a wireless charging dock (the additional travel charger can be used to power it), I've set it up on my beside table to charge the phone over night. It's extremely convenient to be able to just pick up the phone and place it back at any time to top up the charge. So much so that I'm thinking of setting up a wireless charging pad on my work desk and also in my car, and forgo cables altogether. It uses the Qi wireless charging standard so should be compatible with a large number of charging pads (although Samsung's charger has a Fast Charging mode which charges up quite quickly, I'd guess as fast as a regular wired USB charger, but probably not as fast as the wired Adaptive Fast Charger). There are some really cheap charging Pads on eBay, and also IKEA plans to offer them. The model sold in Malaysia supports dual-SIM. Well sorta-kinda, because they SIM tray can hold either two SIM cards, or a one SIM card and one MicroSD card. In the old days, I'd often end up "moving apps to SD" as the onboard storage was getting full, which meant that if I want to have all my apps around the MicroSD has to remain permanently in my phone. So when travelling internationally and using a local SIM, I'd often put my home SIM in my tablet or a small Nokia I bought just that purpose. I can't do that any more since my home SIM has now been changed to a nano SIM for the Note 7 (my tablet is a micro SIM). With 64MB of onboard storage on the Note 7, my 128GB MicroSD card is mostly used for media files and reference document, so app wise it's probably not an issue. The idea of being able to use both my home SIM and a local SIM simultaneously on the Note 7 is very appealing, although it means loss of access to my microSD card. I use my phone as a music player extensively when travelling, so this is a bit of an issue. There is an amazing hack here that lets you have a microSD and two SIM cards in your device simultaneuously, but it's a bit too risky for me ... if the sim comes lose and the sim tray gets stuck that is the end of your phone. (IDEA: get a tiny microUSB adapter, and plug it using the USB OTG adapter that comes with the Note 7. Then I can still have access to my files on the MicroSD. I need to test if PowerAmp can switch the path to its music folder easily). Yeah, the videos look impressive. Not much practical use beyond not having to panic when someone spills their drink on the table. The display on the Note 7 is gorgeous. It's the same resolution on my 10" tablet, but when fitted into a 5.7" phone, it is amazingly sharp. Maybe it's just me coming from a Note 3 with a broken camera, but I found the one on the Note 7 took really sharp and beautiful photos. And it does it with fewer MegaPixels than the Note 3 too (12MP on the Note 7, 13 on the Note 3).